I’m sort of picking up where I left off in my Tonal Confidence post. I did some digging in my archives, and it seems that I’ve never really talked much about my overall strategies for using EQ. I think I’ve never really gone into this much because so much has been written about using EQ by others, but I’ve been having more conversations lately where what I thought was kind of common-sense audio is turning out to be a new concept for a lot of guys. There’s nothing wrong with that so I figured I’d throw this out so the newer guys might get some new ideas and the veterans can compare and contrast. This is gonna be a longer post, and I didn’t feel like splitting this up so hang on. The worst thing that they ever put in EQ’s was the ability to boost stuff. This quote comes from one of the first Jedi masters who instructed me, Martin Stebbing (Wilco, Will Smith, R Kelly). I was initially reminded of Martin’s thoughts after reading some…well, let’s just call it interesting stuff on the internet that spent a lot of time talking about boosting EQ. While I don’t completely share my old friend Martin’s perspective, I believe he makes an important point so now seems as good a time as ever to talk about EQ. So what’s a good strategy for EQ? Here’s one possibility that is my basic approach these days. I start by pushing up faders with the mindset that I shouldn’t have to do anything. Our preconceptions can play psycho-acoustic tricks on what we think we hear which makes it easy to fall into a mix-by-numbers routine of always reaching for a knob. The way my brain works, if I go into things thinking they’re going to be good to start with, I’m less likely to start over-EQ’ing everything. This way I make moves based on what I actually hear. I know, what a concept. After pushing a sound up, I try and listen and let it sit with me for a bit. I’m primarily listening to see if it sounds natural or not. If it doesn’t sound natural, my first check is the source itself followed by the mic. When I’m mixing I try and place all the mics myself which often cuts out that step, but there are times when I’m occupied elsewhere and someone else on the crew takes care of mic’ing. If those inputs are suspicious, the first place I go is the source. If something still sticks out to me as wrong or unnatural, I try and fix it or clean it up by cutting with an EQ. This method of EQ’ing is often referred to as Subtractive EQ because we’re subtracting sound by cutting/turning down/attenuating frequencies. Our ears are naturally drawn towards louder stuff so turning the junk down lets our ears focus on the louder and more important good stuff. Personally, I find the result sounds much more natural than turning the knob the other way. Plus we don’t lose any headroom and might even increase our gain before feedback in the process. Win win win. A technique I often use for this is something my friend Vance refers to as fishing, but I’ve also heard it referred to as sweeping. Fishing is a technique to zero in on a problem area with an EQ. You boost a parametric band of EQ a bit and fish it around or sweep it until the problem becomes more apparent. This is often done best with a narrower filter to really pinpoint the trouble. When you find the area, turn the filter back down and then start cutting and widening the filter until the junk clears up. It sometimes helps to turn the filter on and off sometimes to check the result against the original sound. A key for me when fishing is to keep my hearing focused on the problem at all times. I always hear and identify a problem first before I go fishing; don’t go looking for trouble if it’s not there. As I’m sweeping for the problem, I listen for that problem area to simply get louder, and when that loudness peaks I know I’m on it. This is very important because as we boost and sweep EQ’s around, our brain can easily take over and throw us off track. We throw our sound completely out of whack in this process. If we take too long fishing, the frequencies we mess up in the process can pull our focus away from the original problem. This is why it’s so helpful to learn frequency ranges by ear. If you can narrow a problem down to a 1 octave area by ear, you can pinpoint the problem a lot faster when you start sweeping. 1/3 octave is even better. Now, let me just say a couple more things about fishing. First, it’s probably not a good idea to do this in the middle of a service or event; that’s just tacky in my opinion. Second, I know there are audio snobs–I consider myself one, by the way–who are going to say that you should just learn your frequencies by ear and cut them. There’s definitely some truth to that, but let’s be real here. I can get it in the ballpark by ear, but I have no shame in going fishing to really nail the problem. And if your 40-hour a week job doesn’t involve mixing or audio of some nature, you should definitely feel OK doing this as well. The more you mix, the less you need to do this; I go pretty fast when I do it these days. Plus, I’ve even seen Robert Scovill go fishing in a mixing seminar so get over it. Boosting is where many of us–myself included–started, but it’s an easy drug. As I said, our ears are much more responsive to loud stuff so it’s easier to focus our hearing on things being turned up; this is part of why the EQ fishing/sweeping technique is popular. I think less experienced engineers often get in trouble with boosting because they focus their thinking on what they don’t hear rather than what’s actually happening, and then they try to turn things up to hear what they want. For example, something sounds dull so they just turn up the high frequencies. Problem solved, right? First off, this is a poor approach because we don’t create sound. Sometimes mixers talk about adding top end or some other frequency in interviews, but I think that’s a dangerous description. In reality, we can’t add anything with an EQ. We can only make what is already present louder or softer. Go back and read that last sentence again until it’s etched in your mind. The next problem in this is when we turn things up we often confuse louder for better. As I said, boosting is a drug. It can sound good at the time, but later on the truth often comes out as our ears adjust back to reality. In our example above, what seemed like a good sound is maybe now harsh and unnatural. But the trouble doesn’t stop there. Did you know that boosting EQ reduces headroom? 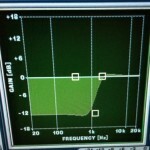 That Gain control on your EQ is a GAIN control, and when it gets turned up the signal level goes with it. 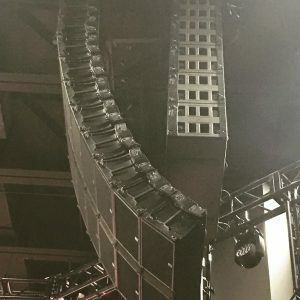 You might get a slight bump in apparent loudness from the sound, but you also get an increase in level within the console that might not be consistent with the audible loudness. When this approach is applied across an entire mix, the increased signal levels can add up to too much level on the console’s mix buss. Boosting is also a quick way to reduce your gain before feedback because, again, we are turning things up. I’m not completely opposed to boosting, though; the knobs go both ways after all. 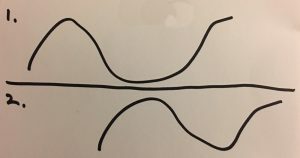 When I do opt to boost, it is typically because I’m trying to bring out or emphasize a distinctive characteristic in a sound, and I tend to use wide filters for this. Something to remember when dealing with EQ is that frequencies correspond to musical notes. As we adjust EQ we affect the musical context of our sound, and in music this is a moving target because as each note is played it has a different set of harmonics within the sound of the instrument that move with the note. So in order to accentuate the particular harmonics I’m emphasizing, I need a wide filter to catch them all which brings up another issue with boosting. Our typical bell shaped filters on our EQ’s have a peak. Boosting with an octave wide filter means we’re getting a variable amount of boosting within that octave dependent on the particular model of EQ. So when we boost, we’re not going to boost everything uniformly. In the studio, we can customize EQ’s a lot more easily on a per-song basis, however, in live applications we have a larger target since we’re often working with multiple songs spread played in multiple keys. Some EQ’s do better at boosting than others because they tend to be wider and smoother, but console EQ’s can be a mixed bag. This is partially why shelf EQ’s were quite popular on classic analog consoles for handling these duties. So, this sort of begs the question: don’t we encounter the same musical dilemmas when we cut? Not typically. 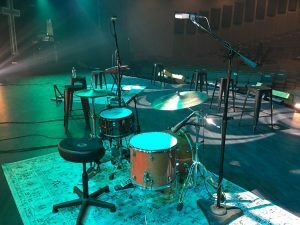 In my experience, the junk we clean up tends to be isolated problems that stand outside of the music. 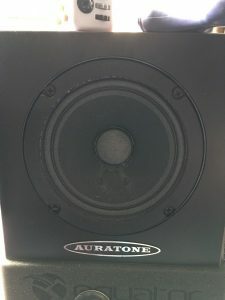 These might be microphone related issues such as proximity effect on a vocal or maybe an odd resonance on an instrument. This is yet another reason why I believe it is always better to clean up problems through subtractive EQ. Wouldn’t you rather clean up issues that will be a problem in every song instead of making adjustments that might only work on songs played in certain keys? Let me wrap this up for now with a summary of my EQ strategy: First I get the source and the mic placement where I want it. I do most of my EQ work by first cutting frequencies. I boost here and there to bring some things out, but only after I take care of any cuts. If subtractive EQ is a new concept for you, I emphatically recommend you start developing your skills at it. I know it has made a big difference in my mixes over the years. Try and master those skills before you start boosting, and if you have to boost(sometimes you do) be conscious of what you’re doing and why you’re doing it. Great post. I love how you anticipate my next question (“Don’t we encounter the same musical dilemmas when we cut?”). It’s like you’re inside my head!!! Anyway, you gave a great explanation for why we typically boost with a wider bandwidth and cut with narrower. Some Waves plugins even do this automatically, which I think is cool. Like you, I cut before boosting. I’m not ashamed to add a lot of high-end brightness, though. Listening to pop music on a top 40 radio station, I’m just aware of how much shimmering, glistening and sparkling is going on in today’s music. I chase after than (hopefully in a tasteful way) even in live music. I tend to cut fairly wide in most cases. 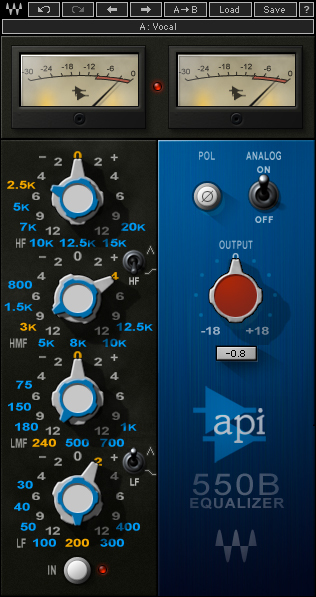 Most of the classic console EQs like the Neves and API’s are fairly wide and are often referred to as “musical”. Taking low end out and simply turning an input up can sometimes get you the equivalent EQ “curve” to increase brightness without the negative effects of EQ. Subtractive EQ is the way to go. Sometimes we make up for a dull or flat mic/instrument with a little additive EQ, but I find with the quality of mics, instruments, and audio equipment, this is generally more of a slight adjustment, if any at all. That said, drums are a good example of an opportunity for significant additive EQ (e.g. single mic’ing a kick and adding some highs to get a little slap, or adding a little mid-range to a snare to give it a little more punch). It’s also a good idea to (generally) use EQ sparingly, and (attempt to) cut/boost in narrow increments (Q). Wider cutting/boosting results in a more pronounced, fundamental change to the “original sound.” This can be desirable when we want to fundamentally fatten a kick, and add a little slap on the high end. But it can be destructive, even disastrous when we over-EQ, say, vocals, or pure piano sounds, etc. Dave, I like your focus on “natural” sound. We should use EQ to bring out the natural beauty and clarity of every instrument and vocal. EQ also helps us properly “slot” sounds into a mix. Cutting a little mid/mid-high out of the electric guitars can make room to inlay the vocals. Cutting the low-lows out of the bass guitar, and cutting mid-lows out of the kick can allow us to more effectively tuck the kick under the bass guitar for a more cooperative blend. EQ is also useful to adapt a mix to room acoustics. We mix in a very (acoustically) hot room, which requires a significant ~1 octave cut around 1.5-2.0 KHz. The sound system also has a mud problem around 200 Hz, so we notch a little there. Like musicians, rooms and sound systems have “personalities” that need to be accounted for and properly blended. And, of course, another form of “static EQ” is the response curves built into microphones. Mic manufacturers spend a lot of money to perfect their products and make them sound their best over the widest possible conditions. Most mics have varying EQ boosts between 5-12K. Amps, speakers, and DSPs can add EQ artifacts as well. Weather/humidity can also be a factor. And let’s not forget delay/reverb EQ settings. I say all of this to mention that, anymore, when I’m reaching for the frequency/Q/dB encoders, my head is filled with all of the other EQ curves in play. Sometimes I think, “considering all of the other EQ already applied, yeah, for this particular voice, it kinda makes sense to add a little here.” Other times I think, “hey, I’ve already got a healthy cut here on the main mix and sound system – maybe I should leave it alone and look elsewhere.” Rather than just “hip shotting” the EQ, I like to understand what the current aggregate is, as well as what I want the final result to be, before I just add more spice to the sauce. Hey Dave, I don’t mean to school you in an area you’re eminently qualified. I love your written stuff and listen to your podcasts with Sessler, and have experimented with many of your ideas in my own sound environment. Good stuff all around. Rock on!